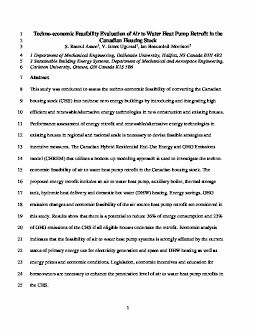 This study was conducted to assess the techno-economic feasibility of converting the Canadian housing stock (CHS) into net/near zero energy buildings by introducing and integrating high efficient and renewable/alternative energy technologies in new construction and existing houses. Performance assessment of energy retrofit and renewable/alternative energy technologies in existing houses in regional and national scale is necessary to devise feasible strategies and incentive measures. The Canadian Hybrid Residential End-Use Energy and GHG Emissions model (CHREM) that utilizes a bottom-up modeling approach is used to investigate the techno-economic feasibility of air to water heat pump retrofit in the Canadian housing stock. The proposed energy retrofit includes an air to water heat pump, auxiliary boiler, thermal storage tank, hydronic heat delivery and domestic hot water (DHW) heating. Energy savings, GHG emission changes and economic feasibility of the air source heat pump retrofit are considered in this study. Results show that there is a potential to reduce 36% of energy consumption and 23% of GHG emissions of the CHS if all eligible houses undertake the retrofit. Economic analysis indicates that the feasibility of air to water heat pump systems is strongly affected by the current status of primary energy use for electricity generation and space and DHW heating as well as energy prices and economic conditions. Legislation, economic incentives and education for homeowners are necessary to enhance the penetration level of air to water heat pump retrofits in the CHS.